Léna Roy: The Name of This Book May Change . . . The Name of This Book May Change . . .
What's in a name? Everything. Nothing. Marketability. Predictions of marketability, trends. Hi guys! As I work, I have been deeply considering the title. I have been thinking about CLIMBING SLICKROCK, but I still like MOONFLOWER much better, as I consider it an openly inviting metaphor with multiple levels of meaning. After talking to some men, I think MOONFLOWER combined with a cover illustration suggesting that metaphor could be an evocative way of reaching boys. If you've been to any boys' clothing stores lately you see a lot of shirts using soft and hard symbols together - things like skulls with sunbursts and dragons with flowers. My own boys play Rockband on their wii game, and the graphics have these same contrasts - sinuous forms matched with dangerous animals. My husband's heavy metal CDs too! Some of them have oblique or even artsy titles, like Nevermind, by Nirvana. Certainly The Grateful Dead with their album covers attract both genders! Since the Moonflower represents resurrection and rebirth, but also death and danger, couldn't a good illustrator do a lot with this imagery? Hmm? No. Maybe something with Edges in it? They said. Ugh. Too cheesy, too obvious I thought. 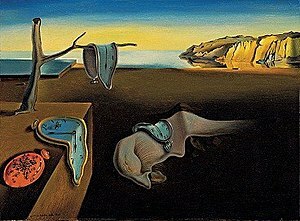 I lobbied for The Persistence of Memory, a nod to the Salvador Dali painting, one of Luke's favorites. (And isn't it strange that I could do that? There's no copyright on titles . . .) It was a serious contender, but ultimately the publisher thought it was too adult and too literary. In the meantime, I have met many more authors and have found that it is rare for a working title to become the published title, for all of the reasons stated in my first paragraph. However, I still think that it's very important to have a working title for your manuscript - it makes it real, it gives it weight. Just know that it's all subject to change, and that something even better could be around the corner . . . words to live by, huh? It's so encouraging to hear bits of your journey to publishing EDGES. I don't know anything about publishing and it doesn't make sense to me, either, so it's nice to know you still feel that way after achieving success. I have a working title for my novel, but I'm sure it will be quite different in the end as well. I was way too attached to mine - it was a good lesson! One-word titles, when they're just right, are great. Plus they're easy to remember! You are absolutely right Dawn!